Slope: linear approximation of the slope of the yield curve across all seven Treasury durations as available. Short-Long Slope: difference in slopes between the short end (T-bill to 5-year Treasuries) and the long end (5-year Treasuries to 30-year Treasuries) as available, as a rough indicator of yield curve curvature. 10-1: spread between the T-note yield and the 1-year Treasuries yield. 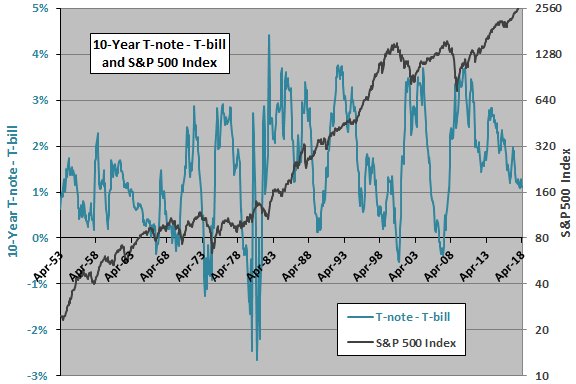 10-.25: spread between the T-note yield and the T-bill yield. 1-.25: spread between the 1-year Treasuries yield and the T-bill yield. 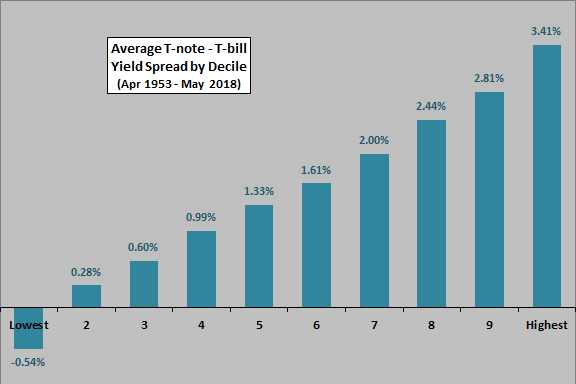 (10-.25)*.25: spread between the T-note yield and the T-bill yield, scaled by the T-bill yield, giving more (less) emphasis to the spread when the T-bill yield is high (low). All correlations are positive (steeper yield curve is better for stocks than flatter), but they are not high. Correlations for alternative 6 are strongest at all horizons. Since the more conventional alternative 4 is competitive (and alternative 6 has extreme values during some subperiods), we focus on the predictive power of the simple spread between T-note and T-bill yields for future stock market returns. Note that future return horizons longer than one month involve overlapping measurement intervals that may distort correlations. 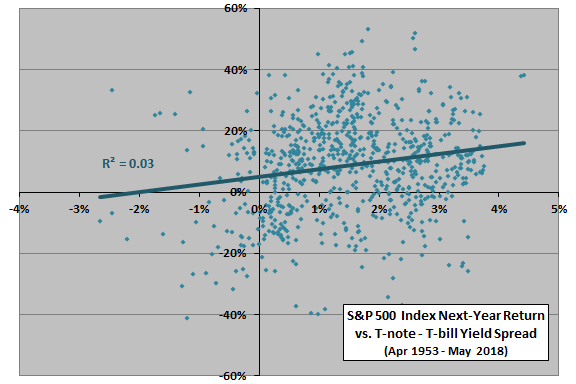 How does the spread between T-note and T-bill yields change over time? The next chart plots the spread between T-note and T-bill yields (left axis) and the S&P 500 Index (right axis) over time. The average yield spread over the full sample period is 1.49%, with maximum 4.42% and minimum -2.65%. Visual inspection offers no obvious connection between the two series. On what forecast horizon for stock market returns should we focus? 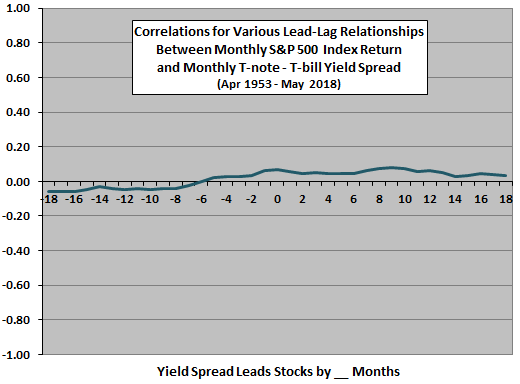 The next chart summarizes Pearson correlations between S&P 500 Index monthly return and monthly spread between T-note and T-bill yields for lead-lag scenarios ranging from stock market return leads yield spread by 18 months (-18) to yield spread leads stock market return by 18 months (18). 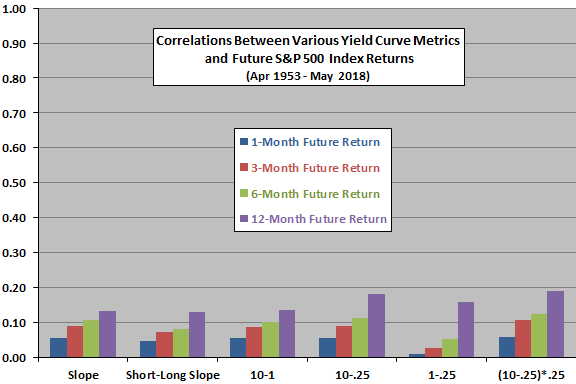 Results indicate a positive but weak and diffuse relationship between yield spread and future monthly stock market returns at horizons of 1-12 months or more. To consolidate these weak positive month-by-month relationships, we focus on 12-month future stock market returns. The following scatter plot relates the S&P 500 Index 12-month future return to the spread between T-note and T-bill yields over the available sample period. The Pearson correlation for the relationship is 0.18 and the R-squared statistic 0.03, indicating that variation in yield spread explains about 3% of the variation in next-year stock market returns. In other words, a steep yield curve is generally a little better for future equity returns than a flat or inverted curve. Note that 12-month return intervals for these data overlap, overstating sample size and potentially distorting statistics. In case there is a material non-linearity in the relationship, we examine average next-year stock market returns by ranked tenths (deciles) of yield spreads. 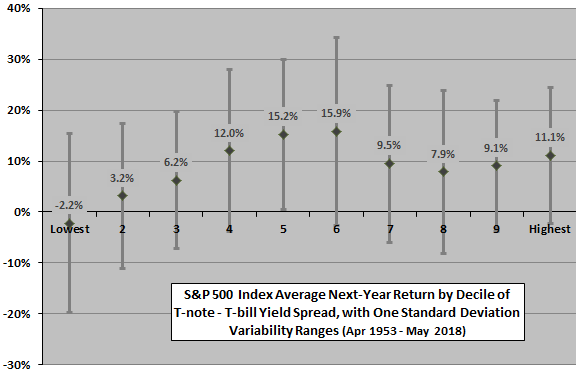 The next chart summarizes average S&P 500 Index 12-month future returns by decile of spread between T-note and T-bill yields over the available sample period, with one standard deviation variability ranges. The average S&P 500 Index return for all 12-month intervals during the sample period is 8.8%. Results suggest that middle values of the yield spread distribution tend to be most bullish, while high (low) values are bullish (bearish). There does not appear to be a consistent relationship between the yield spread and variability of stock market returns. There are 77 observations per decile, but measurements are overlapping, so observations are not independent. The number of independent 12-month returns per decile is only 6.4, so the sample is very small for this kind of breakdown. What are typical values for the yield spread across deciles? The next chart summarizes average yield spread by decile over the sample period. Results suggest that a low spread is well under 1%, a middle-range spread is 1%-2% and a high spread is 2%-4%. All of the preceding analyses are in-sample. 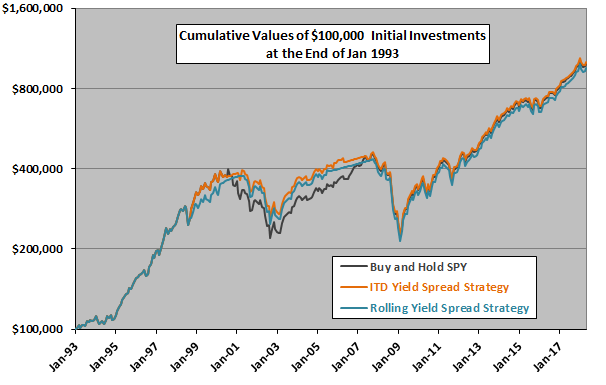 Could an investor operating in real time exploit the weak predictive power of the yield spread? We can estimate monthly signals just before month ends (slightly anticipating the yield spread), such that any switches occur at the same month ends. Trading frictions for switching between SPY and cash are 0.1% of the account balance. Cash earns the T-bill yield. Results are similar for all three strategies. Yield spread signals offer some edges in the middle of the sample period, but the edges are not compelling. Average monthly net returns for buy-and-hold, ITD and Rolling strategies are 0.84%, 0.84% and 0.82%, respectively, with standard deviations 4.07%, 3.95% and 3.84%. Compound annual growth rates are 9.5%, 9.5% and 9.3%, respectively. Maximum drawdowns are clearly similar. The ITD (Rolling) strategy is in SPY 93% (88%) of the time. Results are largely insensitive to trading frictions since the ITD and Rolling strategies generate only six and ten switches, respectively. In summary, evidence from simple tests offers little support for a belief that investors can exploit the T-note minus T-bill yield spread to time the U.S. stock market. Neither the in-sample nor out-of-sample tests employ long series in terms of number of business/interest rate cycles. As noted above, sample size is modest for analyzing ranges of yield spreads with an annual forecast horizon. Other yield curve metrics and signal rules may generate stronger results, but testing many combinations increases data snooping bias, such that the best combination would increasingly overstate expectations. Use of daily yields for Treasuries, rather than monthly averages of daily yields, may affect findings.